Mr Gibson writes with a style that is so thick that you can cut it with a knife, he creates a vision of the near future that shows us the worst of what we may be heading for but at the same time, its pretty cool. 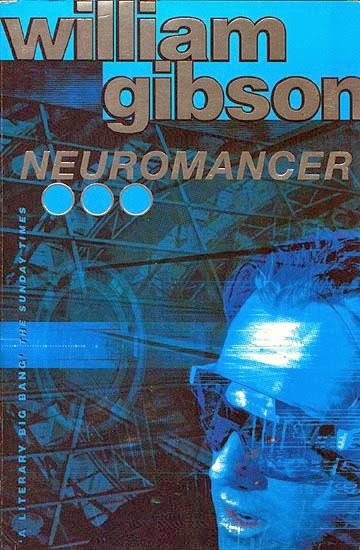 I say that because not only did Gibson popularise the word Cyberspace but he also all but created the Cyberpunk genre. Cyberpunk, in case you are not familiar is a setting focusing on high technology and struggling every day life style. I believe the cyberpunk enthusiasts describe is concisely as "hi tek - low life" Its something like Blade Runner, The Matrix and the Game Deus Ex but not confined to those. Neuromancer follows the adventure of burn out cyberspace 'Cowboy' Case clawing his way back to success with the help of a nefarious gentleman with a shady past and a 'Razergirl' known as Molly, who had surgically implanted silver lenses for eyes and retractable blades on her fingers. I don't want to spoil the actual plot for anyone more than that but the book had some serious depth to it and at times jumps about in a way that leaves the reader disconnected, to reflect the emotional state of the characters. The writing style does not make for an easy read but does give you a satisfying one. At times there are lines that seem to be a little on the 'classic' side but as long as you remember that these tropes are only so over used because Gibson came up with them originally they are easier to swallow. words like 'jacking-in' and an overly sci-fi vision of the internet that would be at home on the movie Hackers are all over this book but when it was written these were original concepts. The technology of the story is at times a little dated, like when out main character is trying to 'fence' three Megabytes of RAM but this is a sign of the works age rather than technological ignorance from the writer. for the most part its very stylised and holds up well. This book it quite literally the best thing I have read in the last 12 months, so much so that I have already snagged three more of the Gibsons books from Google Play. If you like Cyberpunk settings then read the works of this writer, even if you don't read this book. you will have no regrets.